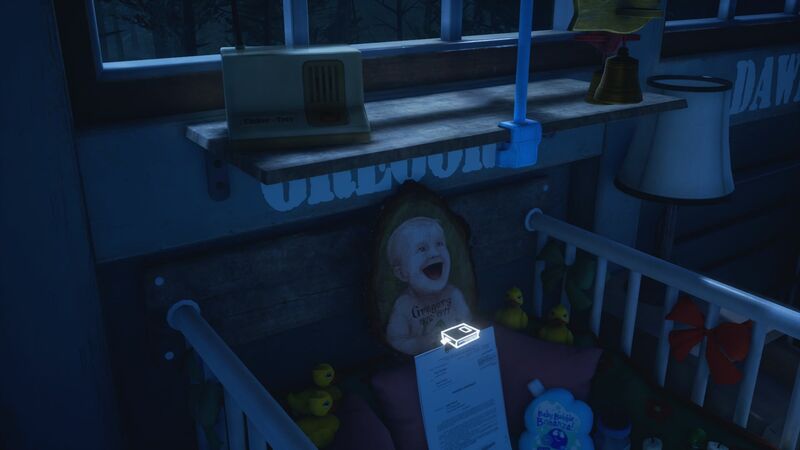 What Remains of Edith Finch (2017) | Yeah nah. After the extended session that was my Batman: Arkham series experience, I figured I needed something to clear out the cobwebs a bit. A short thing that I could zoom through that was completely different to the face-punching and gliding I’d been doing. 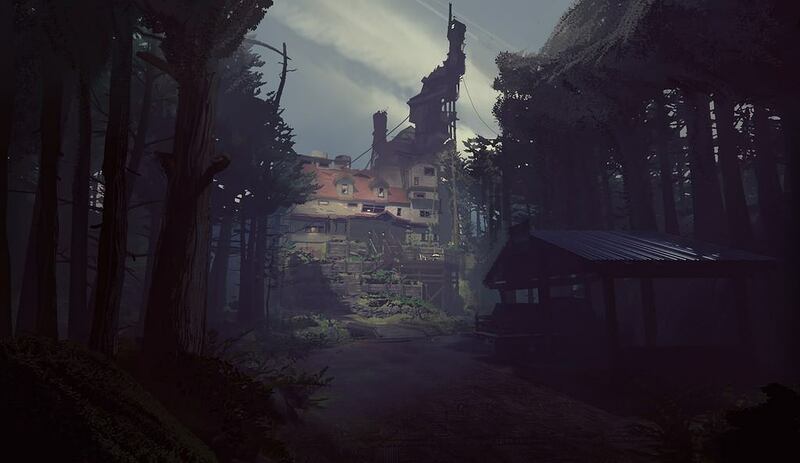 Giant Sparrow’s What Remains of Edith Finch was what I chose. It’s not something that requires a lot of playtime – I think I completed the game and about 80 per cent of its trophies in just under two hours – but it was quite a thought-provoking experience. Some spoilers probably follow, so if you’re considering playing, maybe do that first. I’d been interested in the game since I first heard of its development, and when there was a reasonable PSN presale discount, I pulled the trigger. From the outset, it looked like something I’d dig: mysterious house, a narrative that’s pieced together, and a whole lot of (presumed) dead people. And this is where we’re going? Right. And having completed it, that’s a reasonable descriptor of the game, but it’s also not entirely accurate. 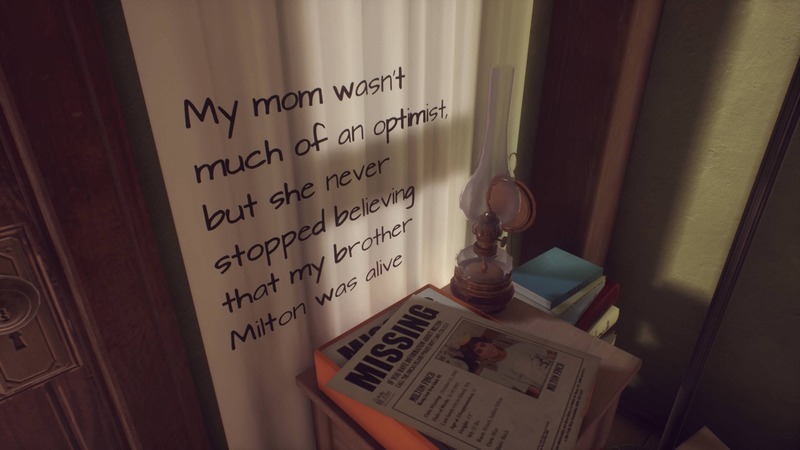 I was expecting something akin to Gone Home – another game where the story is told by wandering around an abandoned house – but there’s more going on here. Other walking simulator games limit you to a very particular style of gameplay; here, Giant Sparrow have added a number of other mechanics that seem to fit the narrative very well. The story that’s told is a simple one: the Finches are a family who are cursed, or at least believe themselves to be. You’re the last surviving Finch, visiting the not-quite suburban Gormenghast (it’s on an island, but you know…) to revisit the family’s expiration history. The game is presented in a pretty artistically appealing way: there’s a graphical similarity to something like Firewatch, say: it presents a prettified version of the real world. The house is a fabulous mess of tacked-on rooms – one of which is a boat – and stacks of books. It gives a sense of a living environment, a place that’s been a home, made ominous and sad by being a repository for human ephemera, but not people themselves. As you progress through, the wind shifts, the light changes. Motes dance in fading sunlight, and loose fittings incur thoughts of intruders, of the villain that we’re trained to think is just around the corner. Family graveyards and pet cemeteries are juxtaposed with happy snaps and wind chimes. It’s eerie, absurd and yet somehow familiar. Pretty sure those additions aren’t up to code. Where Giant Sparrow departs from other games is in the way the game’s narrative is presented: words appear on the screen as part of the vista, rather than a subtitle. They fall to the floor as doors open, they are stirred into sense by the motion of a kite. They live, and create a space between storybook, game and cinematic experience. It can appear a bit tricksy at times, but when it works it’s very effective. The game also treats the player as an adult – there’s little in the way of on-screen prompts, so discovering how the game works is something that occurs naturally. Another departure is in the addition of different play mechanics. Each individual’s tale features a different way of playing. Yes, each person’s tale will end in death – this much is clear from the outset – but the way we get there changes each time. There’s animal simulation – gum that shark down that hill! – and kite flying, processing plant drudgery twinned with RPG exploration, and a comic book tableau. They could be perceived as a bit self-indulgent, but they fit the characters they’re talking about, and provide more show-don’t-tell information than could be shoehorned into any number of audio logs. By the end of the story, everyone that’s come before you has died. You’ve taken over the controls as they expire, mostly, and what’s weird is that you’re pushed to consider it more than you’ve probably ever considered expiry in a game. (Certainly, there’s not much reflection in most FPS titles.) So the ending – though you know there’s a next generation on the way and that the future is unwritten, despite what the Finches may believe – is hopeful, but tempered with the knowledge that you’ve just spent a bunch of time shepherding adults and children (including an infant) towards the Grim Reaper. It pushed me to think about my role in their demise, at least, and felt a more emotional experience than I would normally find in a game. When you complete the game, you can replay any section you like. There’s some I’d willingly play again for the sake of grabbing trophies, say, but some of the tales are too sad to revisit. The replay value is limited – once you know, you know – but I don’t really hold that against the game, and would probably give it another shot in the future. Oh, this’ll be a laugh riot. Are there problems with the game? Sure. Technically, it’s possible to miss a move-the-story-on trigger and end up stumbling over dark areas in the house until you find the right place to go. The ending makes sense in terms of the narrative that’s established, but I don’t completely buy a “…and then we all died except for you, kiddo” tale. (Though let’s face it, that’s kind of ameliorated by the fact that there’s not a lot of games that feature closing moments set in a dying protagonist’s birth canal.) But given the bang-for-buck ratio the game offers, these are quibbles: the story delivers enough value in a short time to ensure it doesn’t wear out its welcome. True, there’s fridge logic moments, but I’m willing to accept that’s the cost of enjoyment. 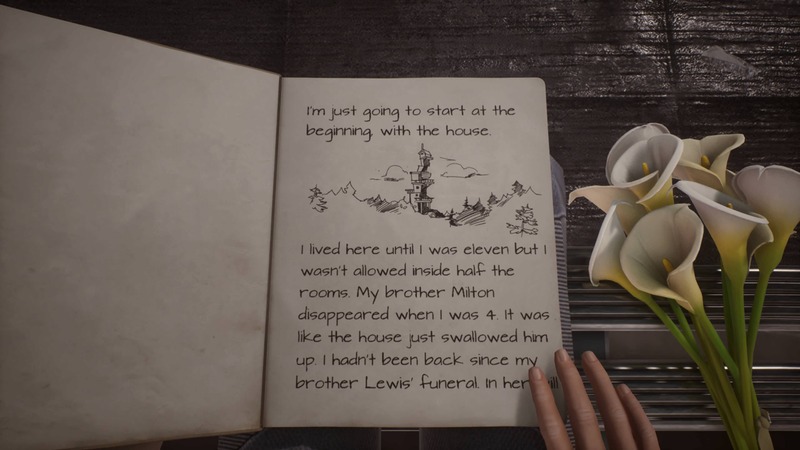 What Remains of Edith Finch is a short, inexpensive story that offers an odd setting and an emotional story that runs just as long as it should. I really liked it, and am cheered by the fact that there’s games like this (or Virginia or Firewatch or Life is Strange or Dear Esther) which are unafraid to make things that are weird and maybe-sorta broken (by big-buck game standards) in order to tell me a story and make me feel things. I’d like more of that, thanks. ← MY PARENTS ARE DEEEEEAD! Pingback: 2017 CONSUMPTION: A LOOK AT SOME STUFF I LIKED | Yeah nah.